Contact us for large parties or special events. During the evenings, Medium Rare offers a unique, prix fixe dinning experience of artisan bread; a mixed green salad; prime, dry-aged steak; and hand-cut fries in a relaxed, fun, neighborhood environment. As we do only one thing, we do our best to make the food and experience exceptional and also a good value. There are only a few wine, spirits, and draft beer choices, but each were selected specifically to accompany your meal. We offer an off-the-menu vegetarian option. 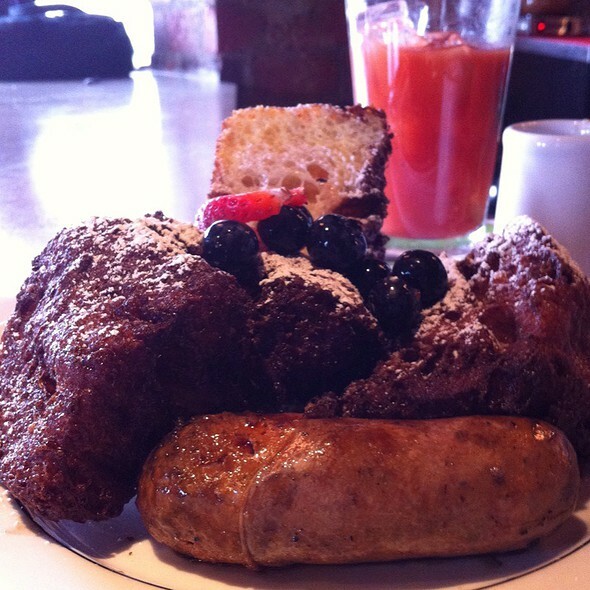 Yes, we do serve brunch on Saturday and Sunday with a great prix fixe including French Toast, Steak and Eggs, Eggs Benedict and bottomless bloody Marys, mimosas and screwdrivers.Please contact us to inquire. We are big fans of Medium Rare in Cleveland Park. This time the service was beyond what we've experienced before. From the moment we walked through the door to when we left, the staff was professional, friendly, courteous, and attentive. It made our dinner more enjoyable than usual and we had relatives for whom this was a first visit. My one complaint about Medium Rare-Cleveland Park is that it's SO noisy. It was really hard to hear our waiter and since I was closest to him, I had to pass on what he said to others at our table. Great place for brunch! We had fantastic service (thanks, James!) and it made for such a great weekend! Food is good for the price. Takes the anxiety out of making a choice. Too much noise. Drinks are weak. This is the second time at Medium Rare and they knocked it out of the park. The food is cooked to perfection and the service is attentive but not intrusive. I'll continue patronizing Medium Rare for years to come. 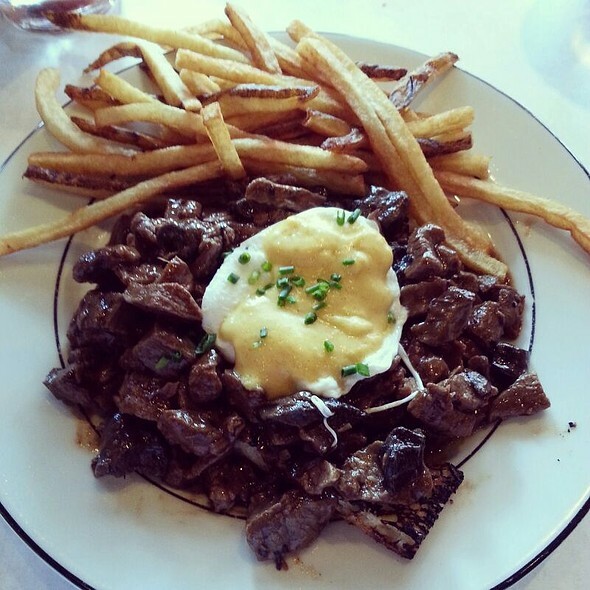 Great neighborhood place — one meal on the menu - salad, steak, and fries- cooked perfectly. Love the French language tapes in the bathrooms! I live in Charlotte but every time I visit my friends in DC, Medium Rare is always the first place I request to eat. It's one of my favorite restaurants!! 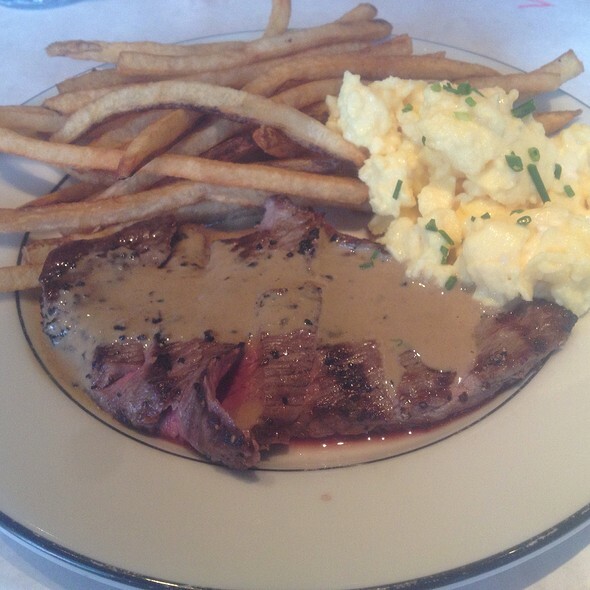 A fair facsimile of a bistro steak for the money if you keep your expectations in line. Don't expect to be able to have a conversation as they keep the music turned up. Great experience. Table ready when we arrived even though the place was packed. Fun company, fun staff, delicious food. Amazing food, don't leave without having dessert! I was really impressed with the value, portions, and ambiance. We went Valentine's weekend so it was packed and kind of loud, but we had impeccable service with Pablo. Always love the food but both locations I have been to are so loud you can’t visit. Turn music down!!! Such a wonderful place. Delicious, simple meal for a great value and fantastic service. Highly recommend. Amazing fish! Service was prompt and fun! Great atmosphere, good people and great food!! Will be back! What a fantastic meal! Thinly sliced pepper steak cooked to your preference, crispy, thin and flavorful frites, tasty salad and a 2nd helping of steak to boot. Old fashioned was satisfying and carrot cake was excellent. This will now be a DC staple for me. Great experience! However, the manager denied us a table; stating that it was for a larger party. 10 minutes later that same manager sat a party of 2 at the very same table; I was a bit bothered by that experience. Nonetheless, the service provided by our server was awesome. Plus, the food was great as always. Moving forward, I would expect more honesty and transparency, otherwise, I will most certainly dine elsewhere. Great place to have dinner. Excellent steak, good wine for a reasonable price. Something I will recommend to my friends! I'll be back:-) Make sure to make a reservation. When I’ve had a bad week and don’t want to make a decision, I head to Medium Rare. Straight forward and satisfying comfort food. Delicious crusty bread simple green salad; decent steak with a lovely sauce; and seductive fries! Seemed like the steak was sliced thinner than usual—to the point where it didn’t have enough texture. However, all in all, it was a delightful meal with great service. 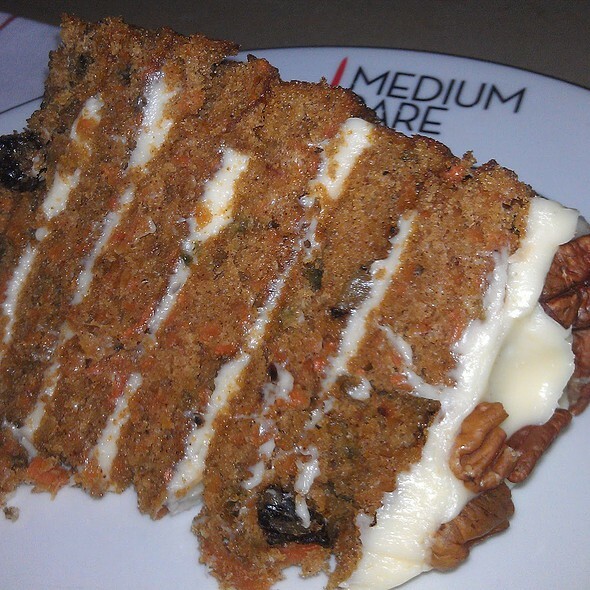 We even saved room to share an outstanding carrot cake! Celebrated my husband’s birthday. It was great! Awesome grub, but a noisy atmosphere - not a great place for conversations. Good food. But too loud, would have liked music volume to be turned down. This is the 1st time have been there. Was difficult to hear my friends. Limited brunch menu but well prepared. This was my second dining experience at Medium Rare. The steak was ok, but not great. My chief complaint was the service, which was inattentive. My family and I enjoyed this meal immensely. The service left a little to be desired but the atmosphere and dinner made up for it. Service was middling at best - it took twenty minutes to be seated with a reservation, after the manager seemingly forgot we were waiting, and it took the hostess getting curious for us to finally get a table - but we came in at the end of the brunch rush, so it's forgivable. The food was as good as it ever is, with perfectly mixed mimosas. Will come again. What a fun restuarant! We went for brunch and would definitely suggest a reservation - they get very busy. 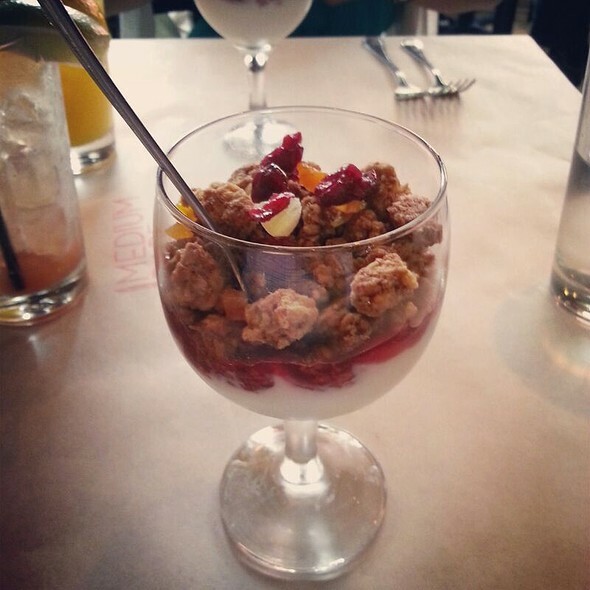 The brunch is a little pricey at about $28 a person but that covers bottomless drinks. Our server was very nice and our glass was never empty. The food was amazing- the portions are huge. The steak is fantastic. This location is right next to the metro so easy to get to and from. Definitely would recommend! I would absolutely come back to Medium Rare! What made the experience great was the value of brunch (really can't beat a multi course meal w/ bottomless mimosas for $27) and the combination of awesome service. The staff had the most positive vibes and ensured we were always taken care of, thanks team! Food was great, would be perfect at a hot temperature, but regardless was just as delicious! Additional photos will be posted to my Instagram, @StoopKidsEat later this week! Thanks team, keep it up! Steak for all!! We dine here regularly. Sat night was not up to your usual excellent standard. 1. some of the steak was fat/gristly. Not experienced previously. Had to wait forty-five minutes past our reservation time. Even though the hostess and manager tried to placate us it is inexcusable to be so disorganized as to not honor a reservation. The Sunday brunch should be advertised as for Millennials only. They alone could tolerate standing around for eons while waiting for a table or so rude and overstay their time at a table texting while others are waiting to be seated. 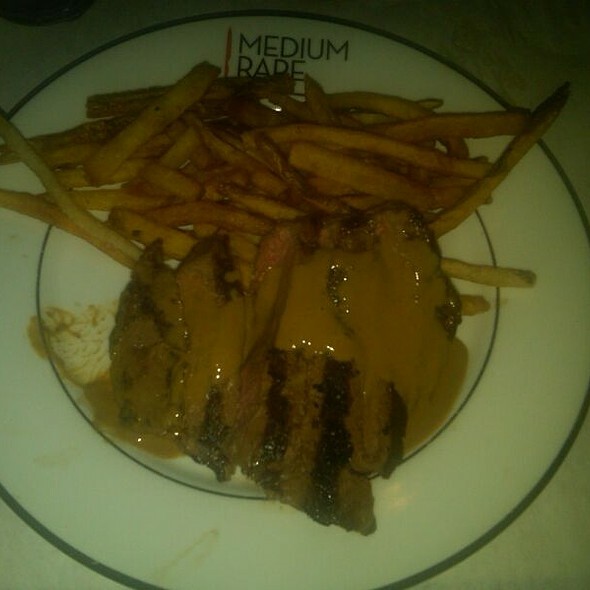 The food at Medium Rare is always good; however the last time I was there the service was incredibly disappointing. I’ve been before and it has never been this bad, so hopefully it was a one time thing. It took ~15 minutes for someone to come up to our table to take a drink order after we sat down and after that we faced similarly long waits to have our order taken and the check brought. Every time a different server came up to us, which gave the impression that they were short staffed and were waiting on us by committee. I’ll be back because I love the food, but I expect better in the future. We love Medium Rare. This was our second time at this location. Our server was attentive and very sweet. Our dinner was great -- there was too much for me when we received our second helping but my boyfriend ate all of his and seemed content. I had a cosmo, which was strong but good! Other patrons were entirely too loud. This is our go to brunch place, so I felt very let down by the service this weekend for my mother-in-law's birthday. I've had many wonderful meals here, but the service was unacceptable this time around. 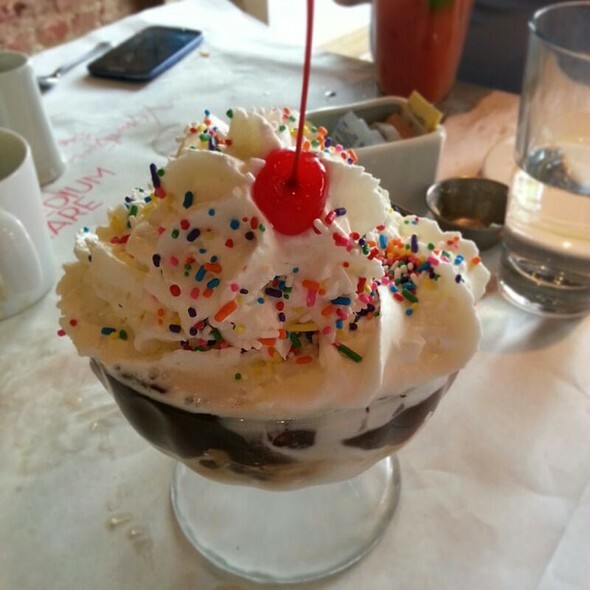 I'm not sure what was going on and I'm usually patient especially when the kitchen is busy during the brunch rush, but our waiter made a number of bizarre mistakes with our food service that were clearly due to carelessness and poor communication. At the end, we mentioned that it was my mother-in-law's birthday. He then implied that they would include a free dessert, which I thought was very kind. When we sang happy birthday, he said "Happy Birthday, Grandma" - assuming that she was our grandmother, which is incorrect. While this may sound petty, but I really think it hurt her feelings and she got very embarrassed that he thought she was much older than she is (and then pointed it out). In the end we were also charged for the dessert, which was disappointing. A must anytime I am in DC. The gravy is delicious! The steak was flaccid and low quality. 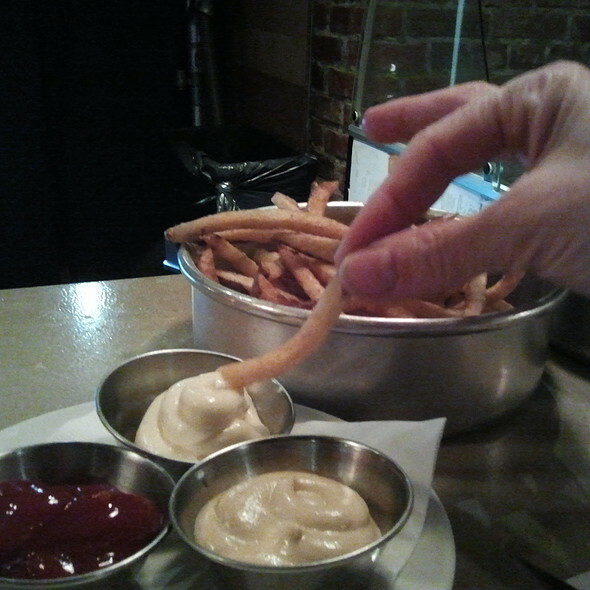 The fries were uninspired. The salad was good, as was the bread. 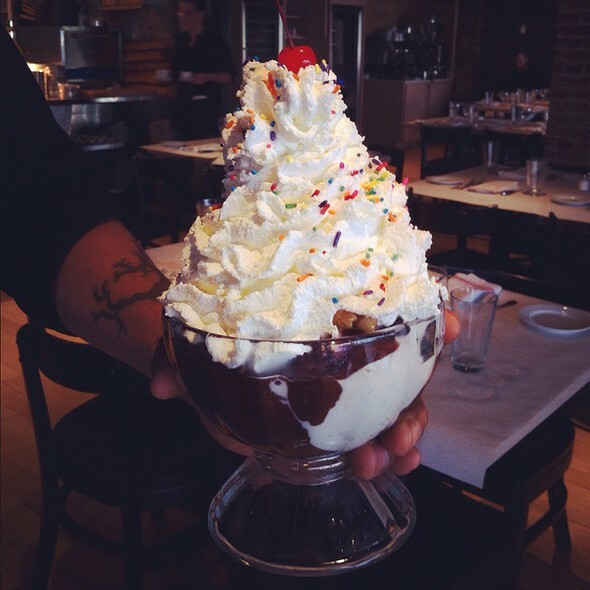 Ice cream sundaes vapid. Waiter screwed up all three drinks (plain water instead of club soda, no olives in the martini), kept trying to get us to imbibe more. 80s Rock soundtrack was grating. Overall felt like a factory food hall, won’t go back. We always love this place, but the servers are getting lax. They toss the prefix menu at you, don't follow-up to see of you need anything, and don't make eye contact.